Presented at Lowther Pavilion - 5 to 8 September 2012. 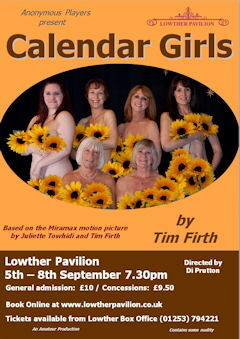 “Calendar Girls”, funny and sentimental by turns is based on the true story of 12 Women’s Institute members who posed for an ‘alternative’ calendar to raise money for leukaemia research after one of them is widowed by the disease. The six women in the play are all good friends, but their success isn’t all good news and the friendship between Chris and Annie, in particular, is severely tested by events. The action takes place in Knapeley village, in the church hall, on top of a nearby hill (John’s hill) and at the annual WI conference in London.